The blessed nation of Biafra led by the supreme leader of the Indigenous People of Biafra (IPOB) Citizen Nnamdi Kanu, a Prisoner of Conscience (POC), the Director of Radio Biafra and Biafra Television (BTV) remains sacrosanct and inevitable. No human being born of a woman can stop the emergence of Biafra as a Sovereign Nation. The restoration project of the land of the Rising Sun (Biafra) is not only a just course, but divinely orchestrated by Chiukwu Okike Abiama (the Supreme Creator of universe) to bring hope to the hopeless, justice to the oppressed, voice to the voiceless and liberation of the black race from the shackles of poverty and mental slavery. The Leader of the Indigenous People of Biafra (IPOB), Citizen Nnamdi Kanu was recently granted bail with stringent conditions by Justice Binta Nyako of Federal High Court Abuja in the bid to stop the restoration of the kingdom of Chiukwu Okike Abiama on earth- Biafra. It is quite unfortunate that the Nigeria Judicial process is being bastardized by such unjustly inhumane and degrading bail conditions in a bid to silence the voice of the IPOB leader Kanu and the quest for the Biafra restoration. The court rulings so far and bail conditions have received a wild condemnation among people of good conscience in the local and international community which indicates that the extent of judicial decay in Nigeria have reached an irreparable stage. The voice of the Leader of IPOB, Mazi Nnamdi Kanu can never be silenced because he is absolutely guilty of no crime, which the Nigeria government mischievously levied against him. On a clear understanding of bail conditions, one can say that Justice Binta Nyako of FHC has find Citizen Nnamdi Kanu guilty already. Nevertheless, Nnamdi Kanu (POC) must be released and taken care of because his health is Paramount to Biafrans and Biafra nation. The Federal government of Nigeria should not underestimate what Biafra agitators can do should the safety of the leader of IPOB, Mazi Nnamdi Kanu be jeopardized after his release. Therefore, all Biafrans hands must be on deck in ensuring that the life of Mazi Nnamdi is protected by all means and at all cost. The ongoing plans by the northern cabals to eliminate the leader of IPOB Kanu is not only laughable but a joke of the century because any harm what so ever or how so ever on Mazi Nnamdi Kanu is same on over 70 million Biafrans all over the globe. The world must be put on notice should anything happen to Nnamdi Kanu, the earth will know no peace. Biafra is the last hope of humanity and cannot be stopped by any man born of a woman. There is a saying that, "He that holds someone down, holds himself too", the Federal Government of Nigeria led by tyrant Muhammadu Buhari and his northern cabals have this evil mindset that holding Kanu will silence the agitation of Biafra, but to his foolishness, the course for the restoration of Biafra is waxing stronger and making waves all over the globe. Recently, the Israeli Prime Minister, Mr. Benjamin Netanyahu commented on the Biafra genocide between 1967-1970, for the first time after decades of silence. The credit goes to Chiukwu Okike Abiama (the Supreme Creator of universe) and the Indigenous People of Biafra led by Mazi Nnamdi Kanu. Indeed, Biafra has reached a journey of no return. Finally, my humble advice goes to the citizens of Biafra: the joy of lord is our strength. Remain resolute, formidable, relentless and fearless before your enemies. Biafra has come to stay. 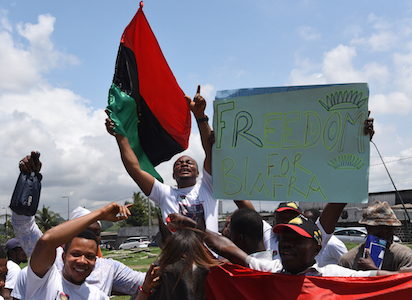 Biafra remains sacrosanct and inevitable. Any world power or enemies of freedom, fighting hard to silence the great people of Biafra is seriously fighting a lost battle. Remain blessed as we celebrate the freedom of Nnamdi Kanu and the restoration of Biafra.